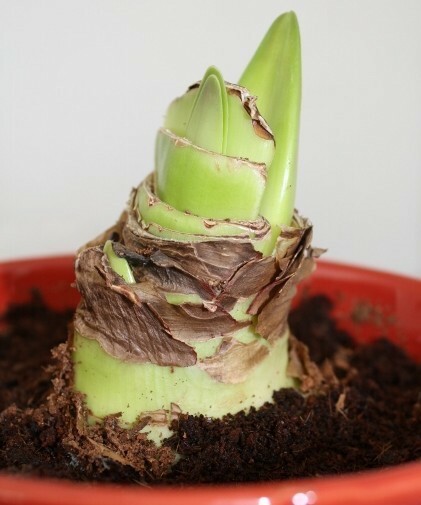 Most garden bloggers will probably start writing about getting your amaryllis (Hippeastrum) to rebloom in September, as it starts to sink into dormancy, but they’ve got it backwards. Now, during the plant’s prime growing season, is when you have to work on getting it ready to rebloom. How you treat it in September is just a minor detail. So, let’s start at the beginning. The amaryllis (Hippeastrum) is a subtropical bulb (zone 8) usually grown as a houseplant. Amaryllis bulbs are generally sold in November and December (some may still be available in January, but hurry!) so they’ll be ready to bloom for Christmas. This is not actually their natural blooming season. Under normal circumstances, in the Northern Hemisphere at least, they’d probably bloom somewhere between the end of January and the end of March, but the bulbs sold are specially treated to bloom early. Getting an amaryllis to bloom the first time is a snap: pot them up and water them and they simply bloom! 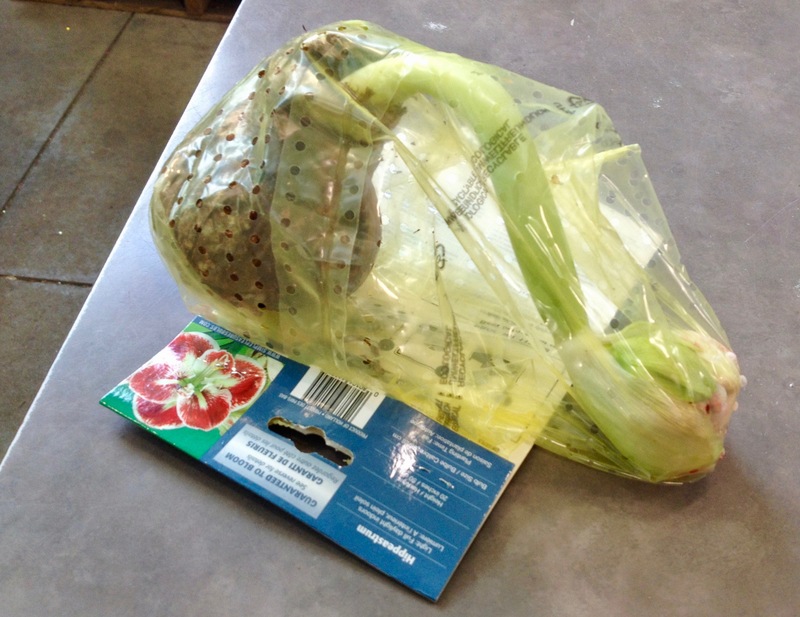 In fact, they’ll bloom even if you don’t pot them up: unpotted amaryllis bulbs will often bloom in the bag or box they’re sold in if no one plants them on time. An amaryllis will bloom under just about any light condition, which is great news, as that means you can place them anywhere while they flower. Afterwards, though, you’ve got to move them to a more conducive spot. The full sun of a south window is not too much indoors. Think of the bulb as being a battery and the sun as being its source of energy. 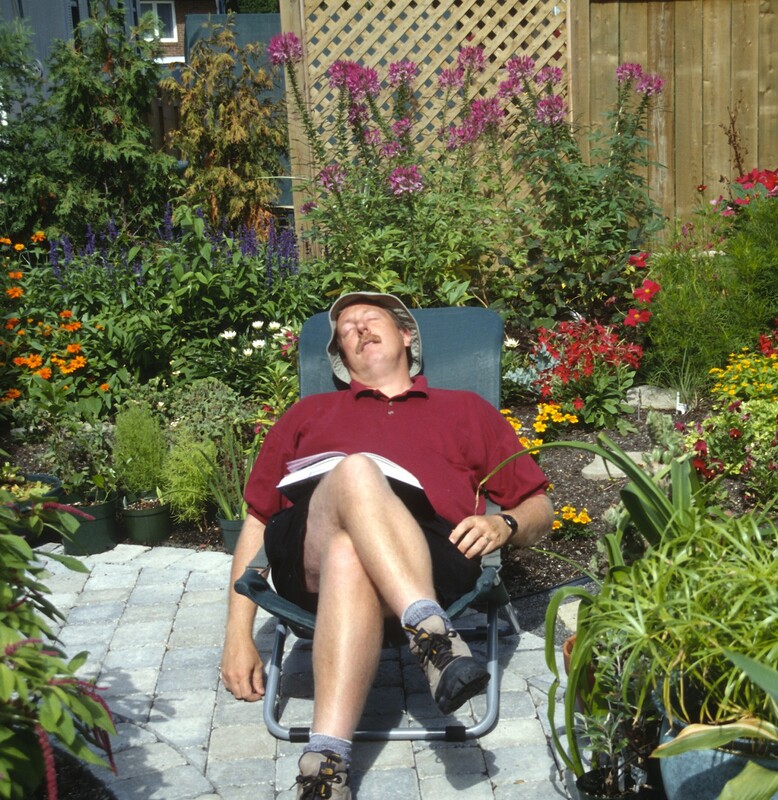 Flowering has drained the battery, now you need plenty of sun to recharge it. When flowering is over, you can cut off the flower stalk (unless you want to collect seed, but that’s another story entirely). Let the stalk turn yellow first, however, for as long as it is green, it will be supplying the bulb with energy. Don’t cut off the leaves, though: they are its primary battery chargers! Your amaryllis will remain in leaf through the winter, spring, summer and into early fall. During this period the plant is also very eager for fertilizer. Fertilize your plant with each watering, adding the recommended dose of all-purpose or houseplant fertilizer to the water as you go. Regular fertilizing and abundant sun lead to a bigger bulb … and the bigger the bulb, the better the bloom next year. Should you place your amaryllis outside for the summer? After all, the sun outdoors is far more intense (windows may seem transparent, but they cut off a lot of light!). That depends. You see, the amaryllis has a serious enemy that may be present in your area: the narcissus fly. The bumblebee-like buzzing adult is rarely seen, but if it lays its egg at the top of your bulb, its fat grub of a larva will hollow your bulb out, possibly killing it and certainly eliminating any chance of bloom. If you or your neighbors grow daffodils (Narcissus), the narcissus fly may well be around and is drawn to amaryllis bulbs like a magnet. So delay putting your amaryllis outdoors until daffodil leaves start to yellow. This spells the end of the adult narcissus fly’s season and you can therefore safely put your bulbs outdoors. Do acclimatize your bulb gradually to outdoor sun by putting it in a shade for a few days, then in partial shade for a few more days before exposing its foliage to full sun. Bring the bulb indoors early in September, well before the first frost. Depending on the genetic background of your amaryllis, its foliage may start to look ratty by September … or it may not (there are evergreen Hippeastrum species and your plant may have them in its family tree). If the foliage of your plant does start to yellow, stop watering it: it’s telling you it wants to go dormant. When the leaves have died back entirely, cut them off. If yours still look fresh and green, keep watering your plant. It’s saying it wants to keep growing. Most hybrid amaryllis, though, will go dormant in the fall. Although many authorities recommend you put your bulb in the darkness during its dormancy, in fact, that’s of no importance. Honestly, do you think a wild amaryllis moves to a dark cave during its dormancy? However, with neither leaves nor flowers, the bulb won’t look like much, so don’t hesitate to hide it from view … as long as you remember where you put it! The same thing goes for temperature. Again, some authorities have you placing the bulb in the fridge while it’s dormant, but that isn’t necessary. Yes, you can place the bulb in a cool but frost-free spot while it is leafless, but you can also keep it at room temperature: it makes no difference. I prefer to put food in my fridge rather than fill it with amaryllis bulbs. Sometime over the next 2 to 4 months, a flower bud or the points of new leaves will appear at the tip of the bulb, even if it has not been watered in all that time. This is the bulb telling you (amaryllises are very talkative plants!) it’s time to bring it into the light (if you stored it in darkness) and to start watering it. Water gradually at first, then more and more as it begins to grow. If you treated it correctly, it will soon be in flower again. Note though that, as noted at the beginning of this piece, it will likely bloom later in the season than the first time, from late January to late March. In fact, some hybrids will bloom a second or even third time, sometime during the spring or summer. 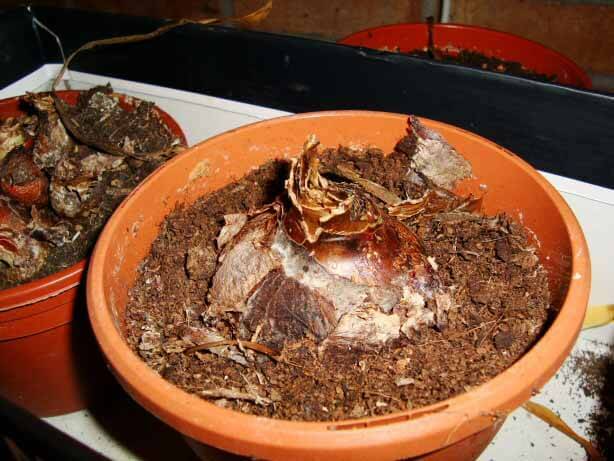 An amaryllis bulb can live and bloom indoors for decades. So, you can get your amaryllis bulb to rebloom … but don’t wait until fall: the time to stimulate next year’s bloom it is now! Christmas may be over, but your Christmas plants are still alive. There is nothing wrong with tossing a Christmas plant into the compost after it has finished flowering if you don’t feel like going any further. No need to feel guilty about this: the vast majority of the millions of Christmas plants sold each year won’t survive to see a second Christmas, so your plant will not be alone. But if you do feel like trying to make yours bloom again, here are a few tips. It’s largely how you treat a Christmas plant after the holiday season that will ensure it will be in good enough shape to bloom again next winter. Once it’s role as a holiday decoration is over, keep watering it as necessary, but do increase the light your plant receives. Very bright light and even full sun will be necessary to get most Christmas plants to bloom again, so move it to the brightest window you have for the rest of the winter. As days get longer and hotter come spring, it may be necessary to move it back from the very sunniest windows, but it should still get as much light as you can muster. And you can even place the plant outside for the summer if possible. Note that light your plant receives will increase naturally as the days lengthen, especially starting in March, and this will help stimulate new growth. And since your plant is now growing, you can fertilize it. From then to September, therefore, feed using an all-purpose fertilizer according to the instructions on the label: this will help give you a more vigorous plant..
A severe pruning in spring or early summer will give a more compact poinsettia next winter. Don’t hesitate to cut back Christmas plants with upright branches (poinsettias, kalanchoes, etc.) if they’re become too leggy. Do this in spring or early summer, but no later than the end of July, because if you prune too late in the season, the newly-produced branches may not be mature enough to bloom. Several Christmas plants (poinsettia, Christmas cactus and Christmas kalanchoe, for example) need short days in the fall in order to bloom in time for the holidays. Put them in a room that is not artificially illuminated at night and they will flower without any special treatment. You can also stick them in a cupboard at 6 pm each evening and put them back in a sunny spot at 8 am each morning, but that takes a lot of attention because you’ll have to repeat it daily for about two months. Read Reblooming a Poinsettia the Laidback Way for more info on how to get a poinsettia to reflower. The amaryllis (Hippeastrum) differs from other Christmas plants in that it prefers to go completely dormant in September, so stop watering it entirely at that time. When the foliage has completely yellowed, cut it off. 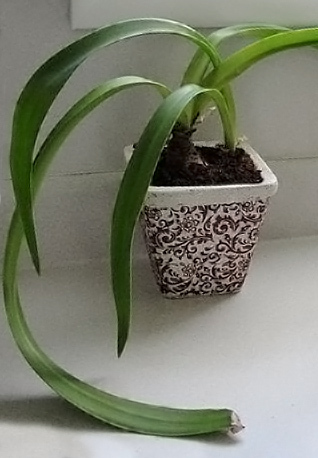 Since the plant is now dormant, it can be placed in a cupboard or closet or other dark spot if you want (most sources insist on that), but in fact, that isn’t really necessary. In the wild, amaryllises grow in full sun all year long and certainly don’t move to a shadier spot while they’re dormant! Just don’t water it for two to three months, period, no matter where it is placed, until new shoots start to appear, indicating that the plant is ready to bloom again. From then on, move the plant to a bright window and start watering again. 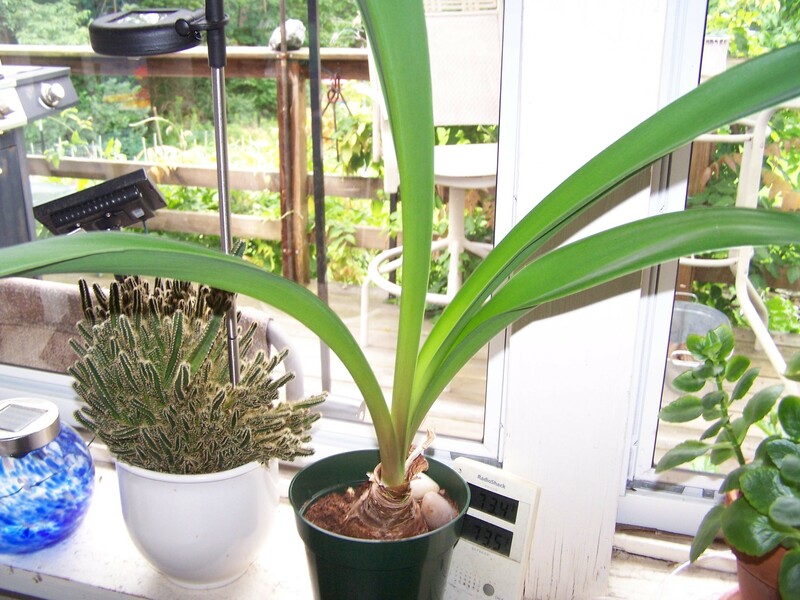 Read Now is the Time to Get Your Amaryllis to Rebloom for more information. The Most Laidback Tip of All! But what is the best way to ensure that a Christmas plant blooms in time for the holidays next year? Simply buy a new plant already in bud or flower come December! After all, your conditions will never be as perfect as those of the grower who produces thousands of Christmas plants every year!